Spring is here and we have the perfect bright & cheerful paper pouch gift for the sisters you visit! 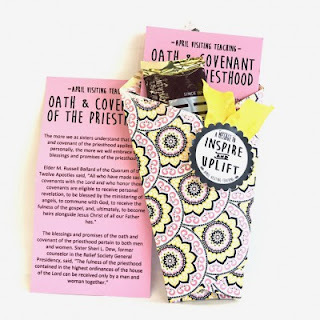 We've lovingly folded a beautiful pink and yellow printed card stock, filled it with a copy of the message from the Ensign, as well as a delicious Hershey chocolate bar. In the April Home Teaching message, President Dieter F. Uchtdorf tells a story about a Rabbi and a soap maker...(you'll have to read it to find out more!)... we have a beautiful box of gourmet soap wrapped up for you, along with the message and of course some darling ribbon.